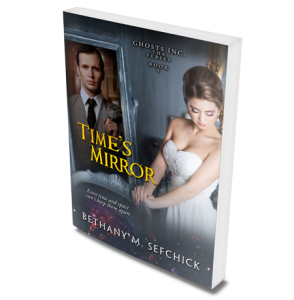 Bethany M. Sefchick | Ghosts, Inc. Welcome to the world of Ghosts, Inc., where the paranormal is normal! Paranormal investigator Mia Thorpe has founded an premier ghost hunting organization in the mountains of central Pennsylvania – a place where traditional investigators mix with those with extraordinary talents and love is always ready to be discovered! This novel is approximately 86,000 words, is written in the modern, adult romance style and is paranormal in nature. It may not be appropriate for younger audiences. It does not contain vampires, werewolves or other such creatures and instead focuses on more traditional paranormal phenomenon. It’s the holiday season and to the world at large, Mia Thorpe is living her dream. As the head of her own paranormal investigation agency, Ghosts, Inc., she seems to have everything she’s ever wanted, including a lucrative television contract with the Alternate Reality Channel. However, Mia is also harboring a terrible secret, one that could destroy everything if it ever came to light. Tim Hawthorne has loved Mia since they were teenagers, at least until she disappeared without a trace. When she mysteriously returned several years ago, asking him to join her newly formed ghost hunting team, she was cold and remote, even angry. But how could he turn away from the only woman he’d ever loved? Then, one frigid December day, Albert Holdsteadt appears at the Ghosts, Inc. offices, asking for Mia’s help. He needs to find his granddaughter before her kidnappers sell her for their own illegal purposes. Or worse. Shamed by her fears and goaded by Tim, Mia reluctantly takes on the case, knowing that once she uses her paranormal abilities he will be able to find her and she’ll have to face her past. But if she confesses everything, will Tim still care about her or will she destroy the last good thing in her life? This novel is approximately 78,000 words, is written in the modern, adult romance style and is paranormal in nature. It may not be appropriate for younger audiences. It does not contain vampires, werewolves or other such creatures and instead focuses on more traditional paranormal phenomenon. Josh Winston hasn’t exactly had an easy time of it in recent months. In fact, some of the decisions he’s had to make during his temporary tenure as acting-president of Ghosts, Inc. have been life or death – literally – and for a man who makes his living seeing auras, that’s saying something! Accountant Regina Cantor has been happily living with a ghost in her house for well over a year. Until one night when it’s clear that something has changed and that Regina’s ghost isn’t quite so friendly any longer. In fact, it’s downright dangerous. Seeking help for her little “ghost problem,” Regina turns to GI for a quick and easy solution – if that’s even possible. Can they work together to find out who or what is behind the nasty entity? And can Regina’s love help to heal whatever is broken inside Josh? This novel is approximately 87,000 words, is written in the modern, adult romance style and is paranormal in nature. It may not be appropriate for younger audiences. It does not contain vampires, werewolves or other such creatures and instead focuses on more traditional paranormal phenomenon. 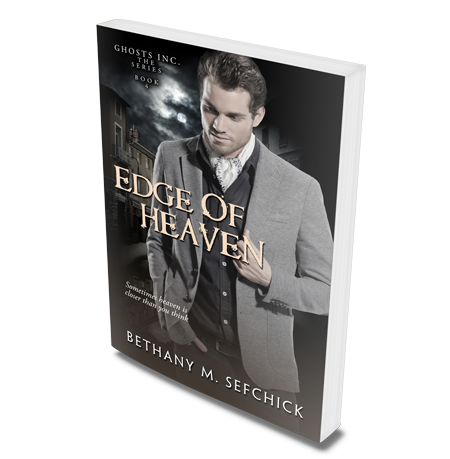 Paranormal investigator Penny Hawthorne has a very big problem – and his name is Simon White. From the moment they met, Penny has been drawn to Simon as if by magic, unable to stop herself from fantasizing about the handsome, Australian-born Confessor. However after the death of her abusive ex-boyfriend, the last thing Penny wants is another all-consuming romance. It doesn’t matter how much Simon says he cares for Penny. She’s simply not ready to risk her heart again. Thrown together on an investigation, Penny has no choice but to work closely with Simon in order to track down The White Lady, the spellcaster who has made Houtzdale, Pennsylvania’s, Sher-Kel Theater a haven for ghosts and ghouls of all types. Will Penny be able to locate the mysterious woman? And will she finally be able to move on from the ghosts of her own past and find love again with Simon? 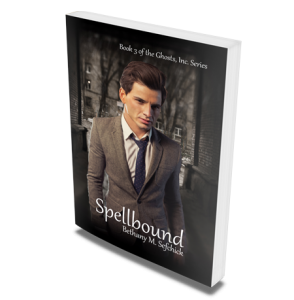 This novel, the fourth in the “Ghosts, Inc.” series, is approximately 83,000 words in length and is written in the modern, adult romance style, and is paranormal in nature. It may not be appropriate for younger audiences. It does not contain vampires, werewolves or other such creatures and instead focuses on more traditional paranormal phenomenon. Paranormal researcher Tesla Dane has never known her father. She doesn’t even know who he is! The only connection she’s ever had to him is a huge, gold gilt mirror he once owned where shadows seem to move deep within its silvery surface in the dark of night. So she’s more than a little surprised when, one night, a sinfully handsome man emerges from those very shadows – a man who has the power to turn Tesla’s world upside down. Inventor Alexander Hartfield had been working for Tesla’s father in a parallel universe since the early 1900s. But now, The Inventor, as her father is affectionately known, has gone missing. Alex hopes that by bringing the beautiful Tesla to Avalon, she can coax her father out of hiding – especially since the man has never met the daughter who bears his name. He also hopes that he can keep his hands off of Tesla. Because she’s the boss’ daughter. And Alex isn’t quite who he claims to be. 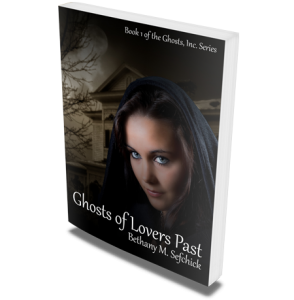 This novel, the fifth in the “Ghosts, Inc.” series, is approximately 83,000 words in length and is written in the modern, adult romance style, and is paranormal in nature. It may not be appropriate for younger audiences. It does not contain vampires, werewolves or other such creatures and instead focuses on more traditional paranormal phenomenon. For the first time, the original six “Ghosts, Inc. 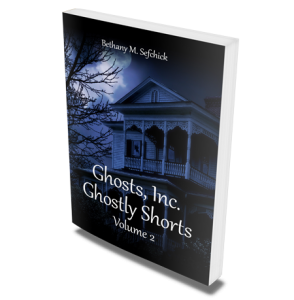 Ghostly Shorts,” which are short stories meant to enhance the GI novels, are available in a single, comprehensive collection for your reading enjoyment. Designed to expand the rich world of “Ghosts, Inc.,” these short stories can be read and enjoyed independently of the novels. 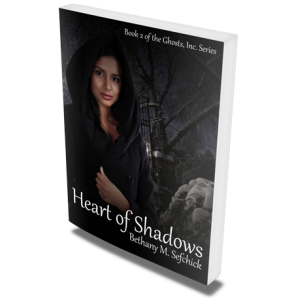 This collection of stories takes place in the time between the first novel, “Ghosts of Lovers Past” and the second “Heart of Shadows,” and tell stories that, while not long enough for their own full-length novel, are every bit as intriguing and romantic, while delving in to the heart of the paranormal world. For the first time, the second set of six “Ghosts, Inc. 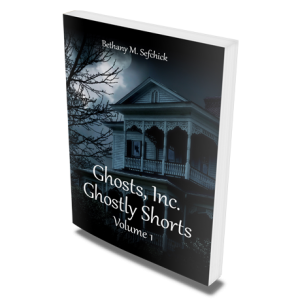 Ghostly Shorts,” which are short stories meant to enhance the GI novels, are available in a single, comprehensive collection for your reading enjoyment. Designed to expand the rich world of “Ghosts, Inc.,” these short stories can be read and enjoyed independently of the novels.